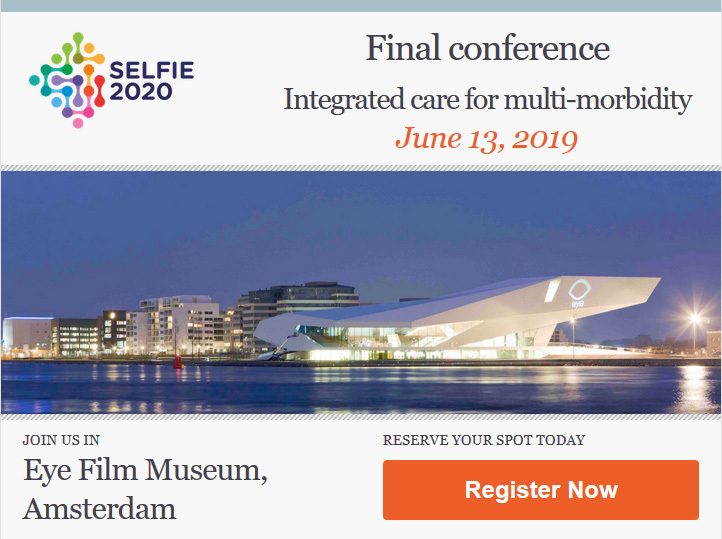 Register now for the ‘Final conference on integrated care for multi-morbidity’ on June 13, 2019 in Eye Filmmuseum in Amsterdam. What is the SELFIE Project? SELFIE (Sustainable intEgrated care modeLs for multi-morbidity: delivery, FInancing and performancE) is a Horizon2020 EU project that will contribute to the current state of knowledge and provide applicable policy advice on integrated care for persons with multi-morbidity. Currently, over 50 million persons in Europe have more than one chronic disease, and this number will increase dramatically in the near future. As a consequence, health care spending will increase to a staggering 20% of GDP. Multi-morbidity will become the number one threat to population health and economic sustainability of health care systems. New models of care for multi-morbid persons are urgently needed. SELFIE aims to improve person-centered care for persons with multi-morbidity by proposing evidence-based, economically sustainable, integrated chronic care models that stimulate cooperation across health and social care sectors. It also aims to propose appropriate financing/payment schemes that support the implementation of these models.